How frequently are water sources available on the Panorama trail from Glacier Point until you get to Nevada Falls? I haven't done this hike before and wanted to know if I can carry just a little water, getting my fill along the hike. That's a nice hike. I did the 4-Mile trail to G.P., over to Nevada Falls, and back down on Fathers Day a few years back with my older children. It's about the only hike I know of where you can stop mid-hike and get ice cream and other treats before continuing on. Only water is at the Illilouette Creek crossing. It's a dry and warm 800' gain to Panorama Pt. The Four-Mile isn't bad, because it is all on a north-facing slope. Thanks for the advice and the map. I'll carry water. Next weekend, I'm going with a buddy who doesn't hike much, so we are going to shuttle up and hike down. The day after, he's going to tool around in the Valley and I'm going to reprise your and my Cables Down hike. I spoke with a ranger today who said there is no snow on the Panorama trail or on the trail up to Half Dome. Amazing what a difference a year makes. Aside from that climb out of the creek, its a nice long net downhill cruise from GP to NF. Tank up at GP and you shouldn't need more than one bottle each. Even if you are a little thirsty, you'll be so stoked by the views (that's why that call in the Panorama Trail) you won't notice. At the cursor, going downhill, after the switch, watch out for a use trail off to your left. Work your way out carefully, and you will get a marvelous and little-known view of Illilouette. Brent, i'm planning on cables down half dome as well next weekend. i'm so excited to try it out. first trip ever to yosemite for me. i have my rope for a swiss seat, figured it would be nice to feel a little more secure / mainly so my husband doesn't freak out but it could be me freaking out! "If you're gonna be stupid, you've got to be tough." Wagga and Saltydog, thanks for the tips. I'm looking forward to it. Ejsurfs, when are you and your husband going? I think we decided on doing half dome Friday. I'll be on the Panorama Trail on Friday, skipping Half Dome, and then will go back and hike Half Dome on Saturday. Have fun. Brent: You have been on this board long enough to know "No Pictures, It Didn't Happen"
Especially would enjoy clear pics of the junction to the lookout, and of course some of the front of the falls. You have been on this board long enough to know "No Pictures, It Didn't Happen"
That rule makes sense to me ;-) I'm happy to bag and post some photos. 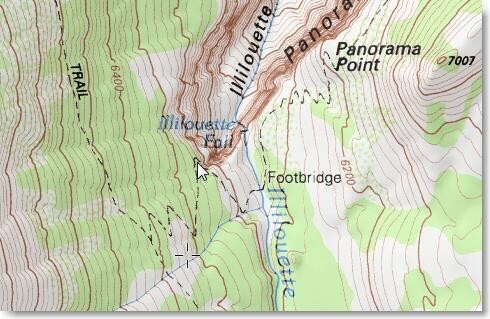 When you ask for "clear pics of the junction to the lookout" are you referring to the place where I take the detour to go the spot you placed on the map? Will do. That is an awesome hike. I did it last July on a super hot day. Even then two Nalgene bottles were enough (and I require more than average water). I also got to see a giant rattlesnake (which I thought was rare in Yosemite) near the bridge near the Happy Isles Nature center. Generated in 0.028 seconds in which 0.006 seconds were spent on a total of 14 queries. Zlib compression disabled.